Try the new Spincast football bet from BetVictor. First £5 of play refunded! The aim of the Spincast is to select the 90 Mins result, Over or Under Number of Goals and the Anytime Goalscorer, in a particular match. BetVictor are now refunding your very first £5 worth of bets on SPINCAST! Try the all new exclusive and unique football bet from BetVictor! The aim of the Spincast is to select the 90 Mins result, Over or Under Number of Goals and the Anytime Goalscorer, in a particular match. 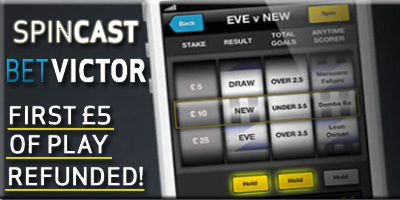 BetVictor are now refunding your very first £5 worth of bets on SPINCAST! Try the all new exclusive and unique football bet from BetVictor. OPEN A NEW ACCOUNT WITH BETVICTOR !!! Select the match you want to bet on the match menu. Spin the reels for a random outcome or choose your own selections by clicking on the up and down arrows on each reel. Once you have the combination tou want simplcy click "Add to Betslip" and place your bet. This offer is only open to first time Spincast players during the offer period. If you have placed a bet on Spincast before Tuesday Oct 23rd you will not be eligible for this refund offer. £5 refund offer is valid for bets placed between Tues 23rd Oct and Mon 31st Dec 2012 only. You must have placed your first £5 worth of Spincast bets within a single 24hour period to qualify for a refund. Only customers first £5 worth of bets on Spincast will be refunded. Refund will be in the form of Promo Cash and this Promo Cash will expire after 30 days. All refunds will take place 24hrs after the final Premier League match in any given Gameweek of Premier League Spincast matches between 23rd Oct - 31 Dec 2012. In the event of a dispute over the award of a goal for anytime Goalscorer for betting purposes, settlement will be based on the scorer as reported by the Opta Index; own goals do not count for the purpose of anytime scorer. Any subsequent corrections or amendments to the result by official bodies will not be considered for settlement purposes. Should a match be abandoned before 90 minutes play then all bets will be declared void. "Try the new Spincast football bet from BetVictor. First £5 of play refunded!"